Camshaft locking pin x 2 – No.T40060. Crankshaft alignment tool – No.T40049. Injection pump/balancer shaft locking pin – No.3359. Timing chains located at rear of engine. Turn crankshaft until just before TDC on No.1 cylinder. Tool No.T40049. Slowly turn crankshaft pulley clockwise until locking pin can be inserted in crankshaft  . Tool No.3242. Remove timing chain LH & RH upper covers  &  . Remove the camshaft sprocket bolt positioned at 5 o’clock on RH camshaft sprocket  . Remove the camshaft sprocket bolt positioned at 7 o’clock on LH camshaft sprocket  . Ensure balancer shaft can be locked in position  . Tool No.3359. Ensure both camshafts can be locked in position  . Tool No.T40060. NOTE: If camshaft locking pins cannot be fitted valve timing is incorrect. Push plunger into tensioner housing  . Insert 3,3 mm pin to lock tensioner plunger  . NOTE: Upper chain tensioner bolts MUST only be used once. If necessary, slacken bolts of each camshaft sprocket 1 turn  . Rotate camshaft until camshaft locking pin can be fitted  . Tool No.T40060. Rotate camshaft locking pin to alignment position  . Tool No.T40060. NOTE: The side pin of camshaft locking pin must be in line with centre of camshaft sprocket. Ensure threaded holes positioned centrally in slots of camshaft sprocket and balancer shaft sprocket  &  . NOTE: Camshaft sprocket bolts MUST only be used once. Tighten camshaft sprocket bolts to 5 Nm  . Remove camshaft locking pins  &  . Tool No.T40060. Tighten camshaft sprocket bolts to 23 Nm  . Remove crankshaft locking pin  . Tool No.3242. Release timing chain tensioner after repairs  . 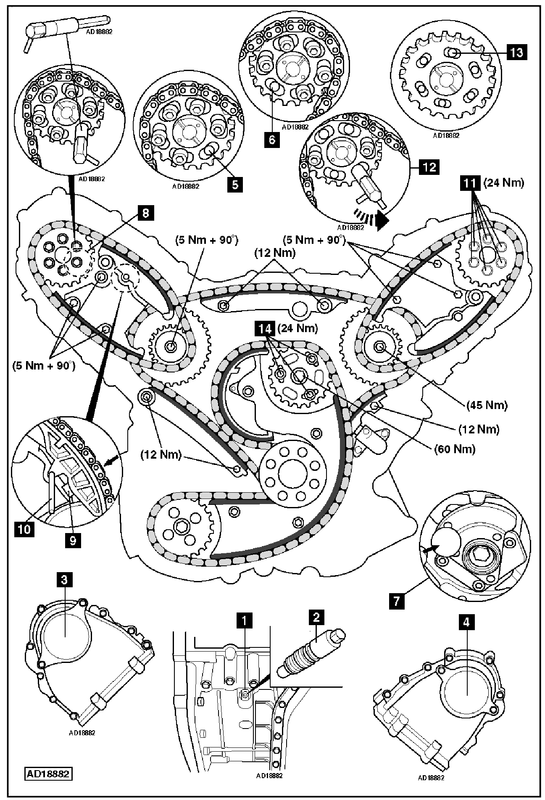 hello, thank you for your help but I can’t see the timing chains schema, could you help me please?